Governor Andrew M. Cuomo today announced that New York food and beverage producers will showcase their more than 100 of their products on Capitol Hill. Annual event to highlight New York's agricultural industry on national stage. Albany, NY - September 14, 2016 - Governor Andrew M. Cuomo today announced that New York food and beverage producers will showcase their more than 100 of their products on Capitol Hill at the 15th annual New York Farm Day in Washington D.C. The event provides an opportunity to highlight the quality and diversity of New York agriculture and its economic impact on the State, in addition to giving producers a forum to discuss important issues and challenges facing the industry today. "Some of this nation's finest food and beverages comes from right here in New York and this event gives us the opportunity to showcase the best the Empire State has to offer to the rest of the nation," Governor Cuomo said. "Over the past six years, we have worked hard to cut bureaucratic red tape for producers and increase exposure for their products. Thanks to these efforts, New York agriculture continues to flourish and play a critical role in the growth of our economy." New York Farm Day starts with an informational workshop in the nation's capital, and a question and answer session for the State's food and beverage producers with the Lieutenant Governor Kathy Hochul and Senator Kirsten E. Gillibrand, New York's first member of the Senate Agriculture Committee in nearly four decades. Later, the state's products—from Long Island award-winning wines to the North Country’s award-winning cheeses—will be featured during a reception, co-sponsored and organized by the New York Wine & Grape Foundation, attended by more than 500 elected officials and distinguished guests. Lieutenant Governor Kathy Hochul said, "I'm pleased to attend New York Farm Day on behalf of Governor Cuomo and extend this administration’s support of our world-class food and beverage producers. With nearly 36,000 farms and over 4,500 food manufacturers, New York proudly produces some of the best agricultural products in the world. New York is also home to a thriving craft beverage community that continues to make unique products using New York ingredients. As we gather in D.C., I look forward to hearing from our producers and sharing the very best of New York agriculture with the nation." Senator Kirsten E. Gillibrand said, "Farm Day is a unique and important opportunity for us to showcase the best of what New York's farmers and producers have to offer. Every year we bring New York to Washington, DC, and I am thrilled that this has become such an anticipated event on the Congressional calendar. New York's farmers and producers are some of the best in the world, and this is a great opportunity to spread the word even further about the quality of our produce. I know we are all looking forward to sampling some of the incredible wine, beer, spirits, cider, milk, food and produce that will be on display." The event is organized according to the State's major wine-producing regions—Long Island, Brooklyn and New York City, the Hudson Valley, the Capital Region Central New York, the Finger Lakes, the Niagara and Erie areas, and the North Country. Each region features a diverse array of foods and beverages, with some including restaurants featuring New York products. Red Jacket Orchards--Black & Blue Stomp (black currant and blueberry juice); Apricot Stomp; Tart Cherry Stomp. Dessert & Ice Wines of New York--A selection of award-winning wines from Casa Larga Vineyards, Fox Run Vineyards, Johnson Estate Winey, Lakewood Vineyards, Lamoreaux Landing Wine Cellars, Osprey's Dominion Vineyards, Penguin Bay Winery, Sheldrake Point Winery, and Thirsty Owl Wine Company. State Agriculture Commissioner Richard A. Ball said, "New York’s growers and producers are incredibly innovative and their products are second to none so I’m pleased that once again, their products will be on display in our nation’s capital for all to sample and taste during New York Farm Day. 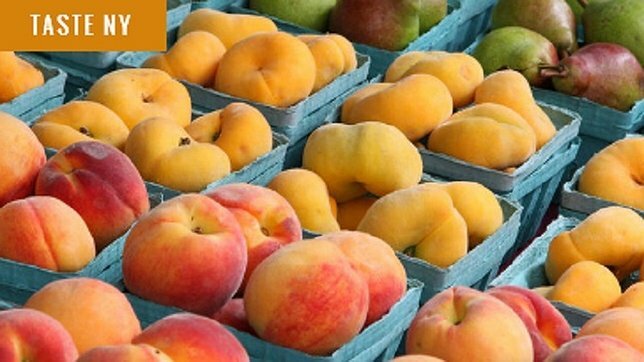 Thanks to Governor Cuomo’s leadership and support from Senator Gillibrand and our other elected officials, New York continues to provide support to our farmers who lead the nation in the production of dozens of commodities and some of the most unique and diverse products in the world." New York Wine and Grape Foundation President Jim Tresize said, "The New York agricultural community is very fortunate to have public officials who understand that without farms there is no food, and that agriculture is a vital part of our economy and way of life. Senators Gillibrand and Schumer, Governor Cuomo, Lieutenant Governor Kathy Hochul and Commissioner Ball have all been great advocates of New York farm families and their many contributions. It is truly a great partnership." New York Farm Bureau President Dean Norton said, "New York Farm Day is a wonderful opportunity to show off what New York’s farmers do best, producing quality, good-tasting food and beverages. New York Farm Bureau is proud to be longtime supporter of the event, and I look forward to having meaningful conversations with Lieutenant Governor Hochul, Senator Gillibrand and other lawmakers and their staff about the importance of New York agriculture and how we can work together on issues that concern our family farms." New York's nearly 36,000 farmers play a critical role in the state's economy. They account for more than $5.3 billion in agricultural commodity sales annually. New York ranks high among the major agricultural states in the nation, ranking in the Top 10 in 30 commodities. It ranks second in apple and maple syrup production, second in cabbage and snap beans, third in grapes, grape juice and wine, and fourth in pears and dairy, which is by far the largest segment of the agricultural sector. The Governor's Taste NY program has proven hugely successful in helping to promote and increase exposure of the State’s food and beverage producers to consumer across the globe. Last year, the Governor announced that Taste NY had tripled the gross sales of participating producers from approximately $1.5 million in 2014 to more than $4.5 million in 2015. This year, Governor Cuomo set a goal to double the gross revenue to $9 million by the end of 2016 through the addition of four new stores, the launch of new partnerships at sports and entertainment venues, and the opening of new locations within the New York State Park system. The Department of Agriculture and Markets has also worked with Food Export USA and Empire State Development to ensure Taste NY products were included in the Governor Cuomo's trade missions to Cuba and Puerto Rico. Taste NY was created by Governor Cuomo in 2013 and is overseen by the Department of Agriculture and Markets. It has created opportunities for local producers to showcase their goods at large public events, such as the Great New York State Fair. The program has also opened stores at Thruway rest stops along the state’s highways and in transportation hubs, enabling travelers to buy New York State’s homegrown and homemade products. Approximately 1,100 local companies have participated in these opportunities, further linking their products and the state’s growing food and beverage market to consumers from across the globe. For more information about Taste NY, please visit www.taste.ny.gov. Connect with Taste NY through Facebook, Twitter, Instagram and Pinterest. LongIsland.com's 2015 Halloween Guide: Spooktacular Fun with Haunted Houses, Trick-or-Treating & More! Subject: LongIsland.com - Your Name sent you Article details of "Governor Cuomo Announces More than 100 New York Agricultural Products to Be Showcased at 15th Annual New York Farm Day in Nation's Capital"